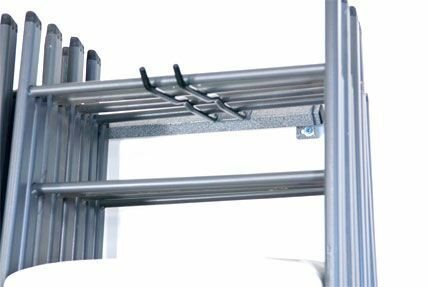 Folding Chair Storage Rack - Garage Organizer MB-23 Monkey Bar Storage. 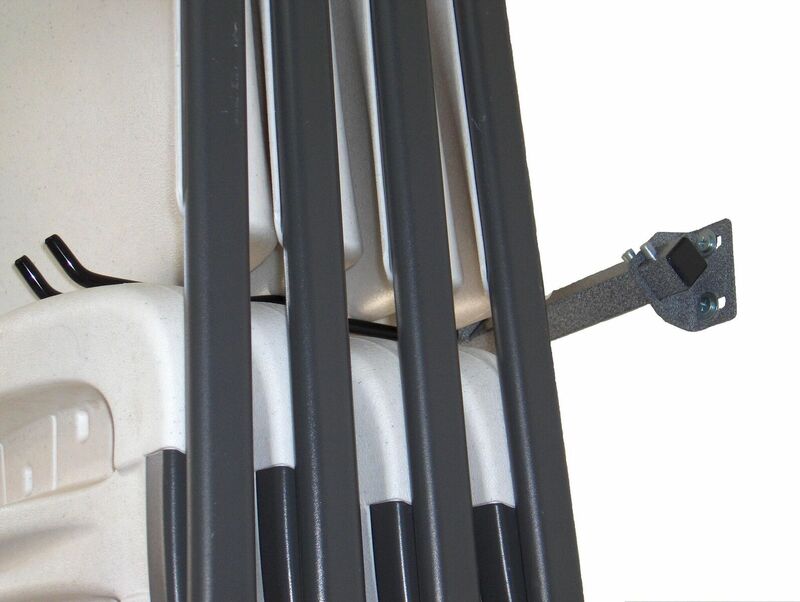 Free shipping to the lower 48 United States for this folding chair storage rack. 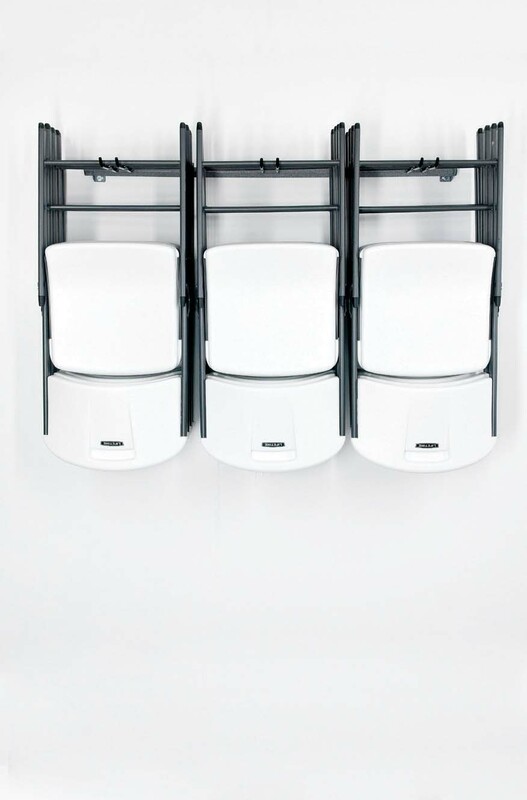 Need help storing you folding chairs you keep around for family get-togethers? 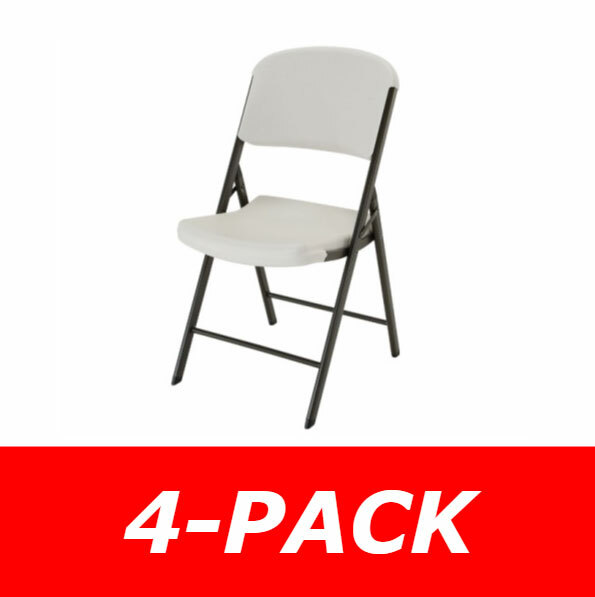 Most folding chairs storage racks are large, bulky, and on casters. The MB-23 gets rid of the bulk and replaces it with convenience. 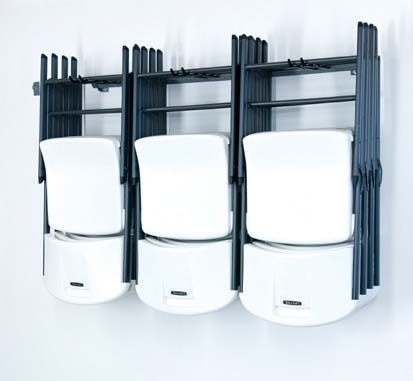 The garage organization rack allows you to store your folding chairs conveniently from a wall rather than stacked up somewhere or shoved in the corner. 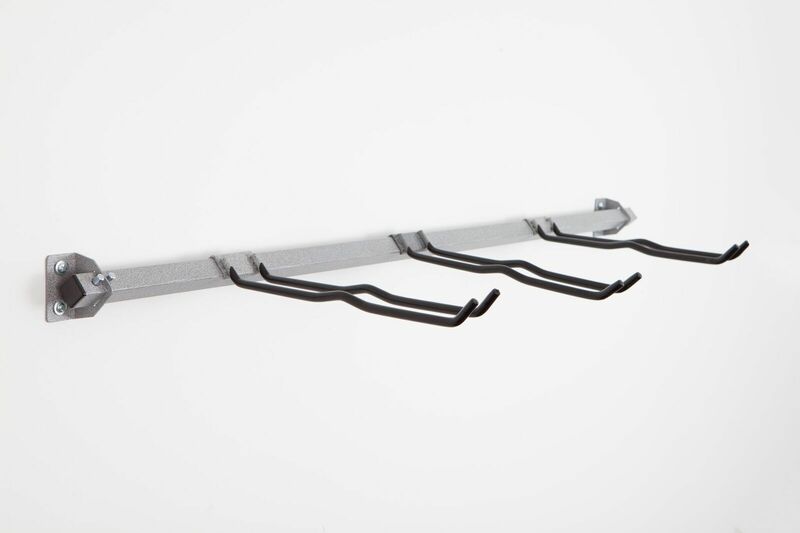 Get your garage organized today with this folding chair rack. The large storage rack holds 15 chairs, (this may vary depending on the size of chair you are using) Note, the picture shows chairs in use, please visit our Lifetime Folding chairs models such as 42803, and 42804 to purchase the chairs featured on this listing. 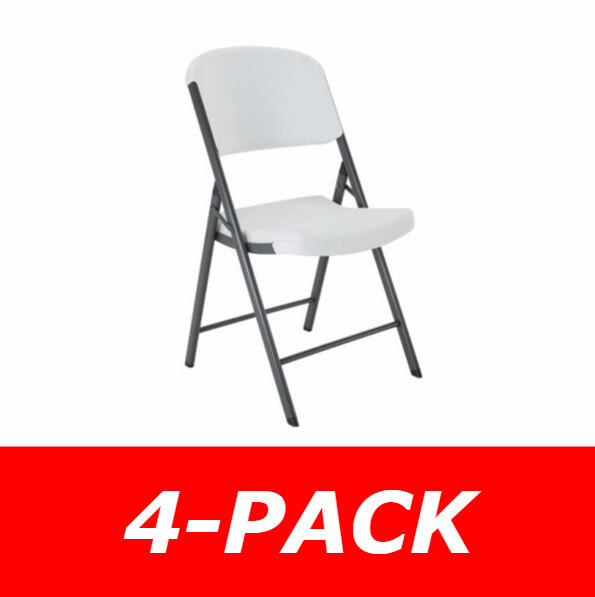 Can store 12 to 15 folding chairs; depending on the make and thickness. Installation can be done very quickly, typically in about 15 minutes. Assembled, the unit is just over 4 feet long and comes out from the wall about 13 inches. Can be used in a garage, shed, barn, closet, or shop. 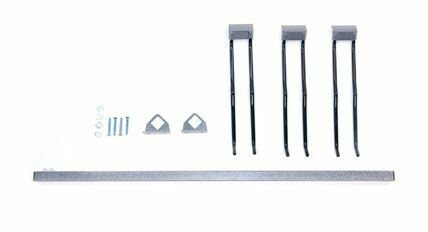 Made with powder-coated steel components. Chair hooks slide on for easy adjusting to the proper size. Comes with a lifetime limited warranty from Monkey Bar Storage. 1 qty. 51 inch Bar. 3 qty. 12 inch hooks. 4 qty. 2 inch wood screws. Q: Can I put this on the wall with sheet rock? A: Yes, you certainly can, but you will want to make sure you hit the studs. Assembled, the unit is just over 4-feet long and comes out from the wall about 13 inches. 4 qty. 2-inch wood screws. 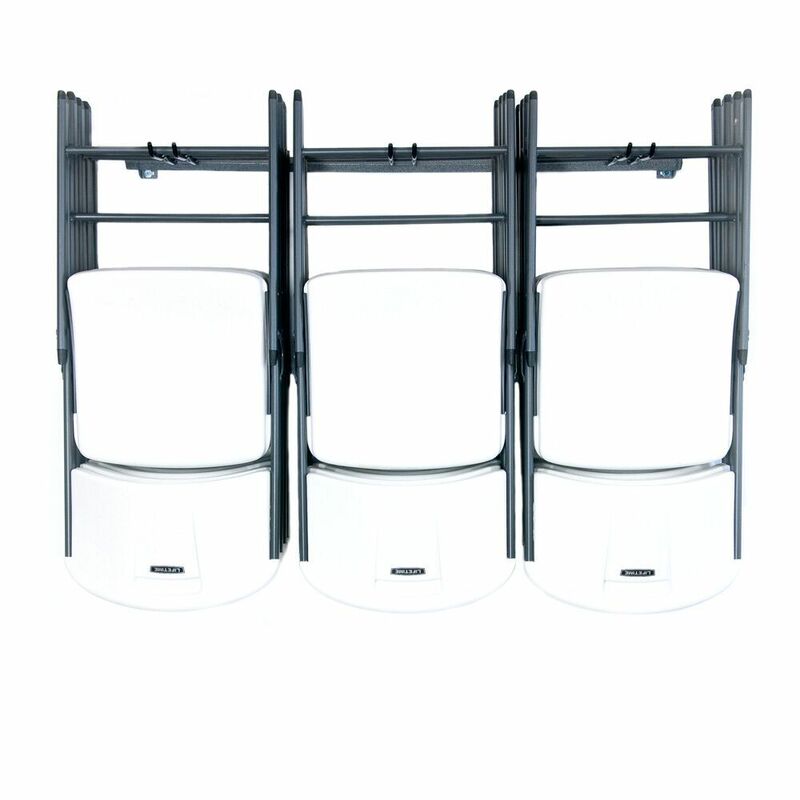 Fast Shipping: Orders for the mb-23 Monkey Bar Storage generally leave the warehouse within 1 business day. Dimensions: 51" x 4" x 3"